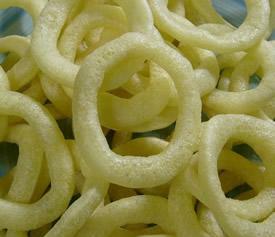 Yangparing is a popular onion ring snack enjoyed by all ages and it's the Korean version of Frito Lay's Funyuns. It is made with premium ingredients and these playful rings have a crisp texture which are packed full of zesty onion flavors. It contains no MSG and it actually has 100mg less sodium than Funyuns per serving. This onion snack is so delicious that it must be experienced. Next time you're in the mood for a snack that's out of the ordinary, try Korea's yangparing which has a unique combination of great taste and crunch.